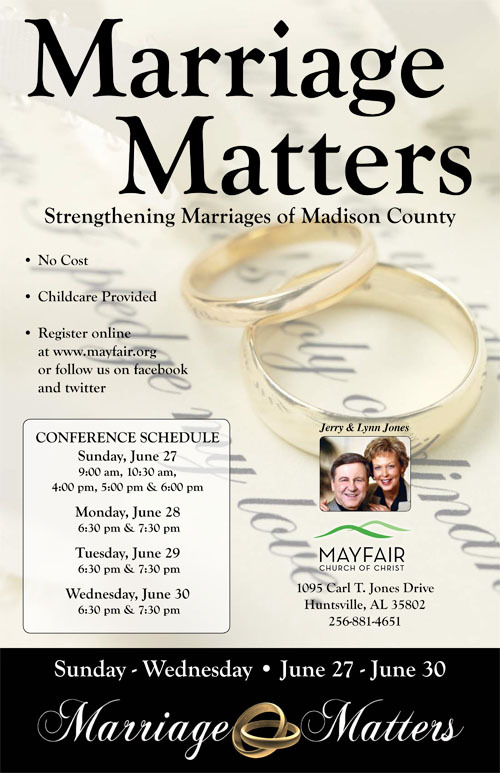 The Mayfair church will be hosting a free marriage enrichment seminar Sunday, June 27 – Wednesday, June 30. For nearly 15 years, Jerry and Lynn Jones have toured the country, presenting the Marriage Matters conference in 42 states. Jerry and Lynn combine the Biblical teaching on the sanctity of marriage with fresh insight and practical counsel for husbands and wives. Each session of Marriage Matters explores some of the complex issues and emotions surrounding relationships and is filled with sound psychological advice and biblical direction. Both professional educators and dynamic communicators, Jerry and Lynn Jones are guaranteed to make you laugh, cry and truthfully evaluate yourself and your relationships. This is a free conference, quality child care provided. To register, click here. Call 256.881.4651 for more information.